Are We Religious or Are We Faithful? Sometimes, people will tell me that they find God in nature (but which god?). But the question remains: Is any of this this how one inherits eternal life? In Greece, there was an elder of Aegina named Ieronymos (died 1966). One story recounted from his life may help us answer our question. 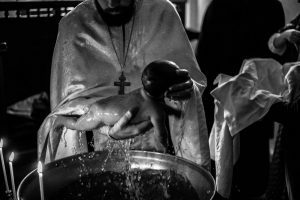 A well-to-do man once asked Elder Ieronymos if he has done enough to be “saved.” He told the elder that he was a good man and obeyed all the commandments. Overall, he was a god-fearing person. “Of course,” the man replied. “Without fail. I never have to ask twice,” the man responded. “Now,” asked the elder, “do you have any children? The answer, of course, is that children inherit when a parent dies. As Orthodox Christians, we believe the same is true of inheriting eternal life. We have to become a child of God, which means being born by the water and the Spirit. 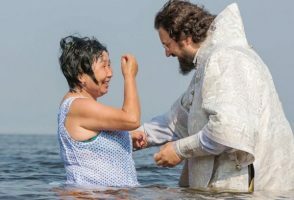 Being “born” of the water and spirit is baptism and chrismation, a beautiful service in the Orthodox Church. This is the means by which we are united to Christ, receive the Holy Spirit, and thus are “adopted” as children of God. Yes, we should strive to live by God’s commandments and live a virtuous life, but salvation is matter of being born again so as to become a child of God. A virtuous life is our response to God’s free gift of paradise. Short of being reborn as a child of God, we’re only a mere servant.